Research post "Manuscripts from Alevi Family Archives"
The work of this research post is first of all focused on handwritten sources from Alevi private property which consists mostly of religious writings, notes relevant for rituals, and collections of poems. Some of those writings are individual notes whose formerly orally transmitted contents were written down for the first time and therefore did not have a written model that they've been copied from. 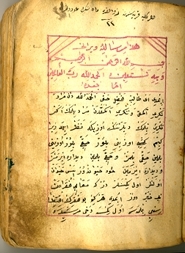 In addition there are copies of previously unknown religious texts of Alevism as well as copies of known dîvân literature and religious treatises. Besides these manuscripts the research post also works on facsimile editions from Turkish archives and libraries. 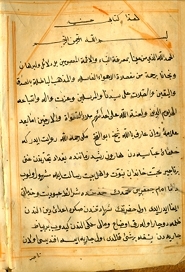 The earliest Ottoman manuscript of the current stock is a facsimile and dates back to the early 17th century. 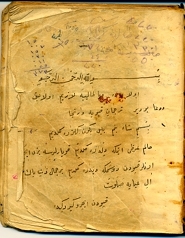 The most recent documents date to the mid 20th century and still in this time they were written in the Arabo-Persian script of Ottoman Turkish. The work on the mentioned manuscripts includes the formal and subject indexing in order to get a first outline of those writings that were and are transmitted, absorbed and preserved in the Alevi context. Thus we make an essential contribution to the basic research on Alevi religious history, whose critical historical descripton is still in its early stages. Besides that, the research post is working in close cooperation with the SFB subproject "Transfer of Ritual of Marginalised Religious Groups Within Islamic Societies of the Near East and in the Diaspora", which is also situated at the department of Islamic Studies at the University of Heidelberg. Thus further insights into the ritual tradition of Alevi communities and into the processes of transmission of both religious and ritual knowledge are provided.